The Women’s Mystery tradition is womb and earth based. It is experiential in nature. In every traditional culture girls would receive teachings and initiations as they went through puberty. Our cycles and our wombs created the oldest of human calendars and we understood our bodies reflected the cycles of the Moon and the Earth. To bring you back to this ancient knowledge, the 13 Moons Calendar has been created to give you a framework for becoming more intimately familiar with the divinity of your body and all she has to reveal to you. As a daily practice, this calendar will assist you in connecting to your own rhythms and inner knowing, to come into more presence and balance in your life. The calendar and companion guide are tools to connect you deeply and honourably to your inner wisdom, to give a sacred context to your life's journey. ​The 13 Moons Calendar has ben created for all phases of a Woman's life. 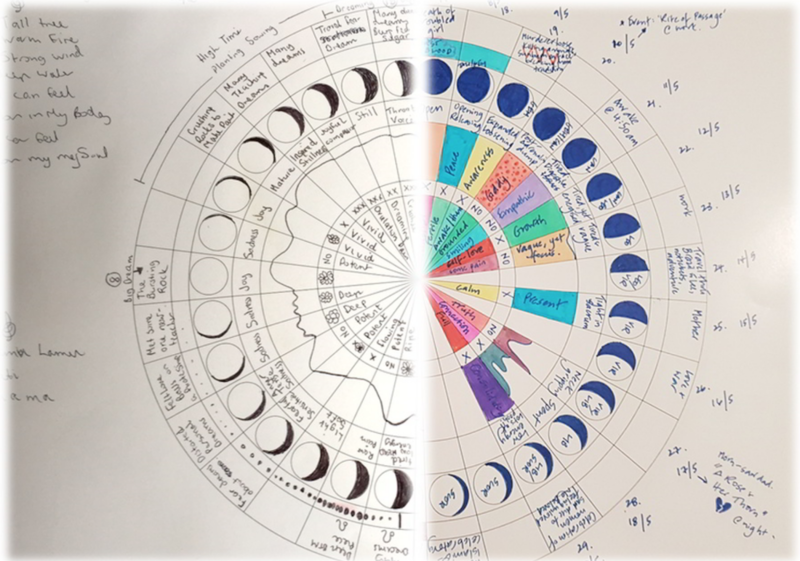 You can work with the calendar to chart your moon flow cycle, including fertility, during pregnancy and your perimenopausal transistion into moonpause and beyond. For anyone with health issues the information gained through charting is gold for any wholistic health care practitioner. As you deepen your relationship with your body and particularly your womb you'll awaken the vast wisdom and power held within. Until you meet your power within, you are not going to find lasting, deep satisfaction in the outside world. Self empowerment comes down to two simple words, know thyself. When you understand your cycle you can drive your life with connectedness and confidence. You might have become accustomed to your anatomy being brandished as an enigma, out of control and unpredictable like the weather. You may feel swept up at the mercy of your hormones and menstrual cycle, feeling frustrated, disconnected and at worst over-medicated. This doesn't have to be how it is - we want to show you how to stand in the eye of the storm with an assured awareness. To teach you not to battle your body; to track and appreciate it, to understand yourself beyond your senses, to know your health in relation to the cycles of the moon. Have a look at how to work with the Calendar below. Q. What prior experience do I need to use the calendar? Q. How much time does the calendar take to complete each day? Q. What is the right way to fill out the calendar? Q. What is the best time to fill in the calendar? Q. What if I miss one or more days? Q. How can I get help interpreting my chart? Q. What if I get stuck and need help? 1. Being apart of the online community in conjuction with the compaion guide book is a fantastic space for support and inspiration that will journey with you over the 13 Moons. Q. What if I am in moon-pause (menopause) ? A. The Calendar is a powerful ally during peri menopause and menopause. It acts as an an anchor when needed and acts as a great navigational tool in your new and changing inner landscape. Through regularly using the calendar, it will reveal hormonal patterns that you may be unware of. Bringing daily attention to your body is key to having emotional balance and assists in acessing the unfolding wisdom being revealed from within. Q. Can I share my Chart or should I keep this private? A. It can be very revealing to others, so it’s entirley up to you. It will give your partners an insight into your ever changing nature, if you are working in a Women's Circle it can be a powerful aspect in your sharing, and from the perspective of Holistic Practitioners, this information would be invaluable in their work with you. Q. Are there other resources to support me ? A. We have a downloadable companion guidebook in our 'Complete Woman package - this will extend your experience by giving you information about the intentions of each Moon, whilst offering you nurturing feminine practices ,meditations and reflection from a sisterhood of women all charting their cycle and taking the 13 Moon journey !